Aragon City Council member Judd Fee asked for Finance Consultant Rick Hartley to come and speak about the city's money problems during a forthcoming February work session. Is the City of Aragon about to run out of money? That's a question of real concern the City Council wants to know for sure, but didn't get a completely straight answer out of Mayor Garry Baldwin during their January work session and later in last week's regular meeting. Especially when funds were tight at the time of writing over the weekend. Council members Candace Seiz and Judd Fee both expressed their concerns over the finances during the city's January work session, and their dismay that money was being spent over what is coming in from monthly income. "We're talking about spending and how much has been spent this year, and we're sitting here baffled about how much has actually been spent," Seiz said. "I think it would be good to have a breakdown. More of an overview of what was spent on equipment versus turnover, and so forth..."
Fee continued the discussion by questioning why the problems still linger. "I do have a problem with the finances," Fee said. "It's been ongoing every month all year long, with nothing being done. If I have to stand up and say no... the monthly expenses are exceeding what we're bringing in. And it's month after month after month. We can't operate like that." They asked for Financial Consultant Rick Hartley, already scheduled to come to the city for several days to prepare audits and budget amendments, to explain what's happening. Based on the city's own bank statements, they could be in trouble. In financial statements provided by city officials, the current account balances as of Friday, Jan. 18 were for the general fund at $16,335.59. The Special Assets Account that previously had at one point more than $200,000 invested in it is now at $20,172.74. The SPLOST 2014 account sits at only $10,231.87. SPLOST recreation funds also include an $88,038.61 balance in the bank. However the problem is that technically speaking, funds generated for SPLOST can only be used for projects or purchases designated in specific areas, like recreation or public safety equipment, and so on. As of the end of December, payroll after tax deductions and medical insurance totaled $23,603.61. That doesn't include monthly expenses like court fees paid out, inmate housing, utilities and much more. Baldwin provided several explanations during the work session as to why funds were so tight. He said first that though money was allocated in different parts of the budget, and money in other places that can be used to pay for expenses in the meantime and the council would have to go through a budget re-alignment process to allocate funds from one place to the other. "Things are not as dire as the snapshot in one place. Everything is fluid, and revenue comes in every day, and expenses go out every day. And right now we're working with all the department heads on purchase orders on anything over $50 goes to Rick," Baldwin said. He added that funds are going toward paying employees, gas, and the daily running of the city government. Council member Debbie Pittman pushed for an explanation to funds having been spent on the Aragon Historical Society for repairs, which Public Works Superintendent Daniel Johnson reported was thus far around $750. Baldwin said electrical problems at the Historical Society caused by damage from chipmunks caused the expenditure. The city owns the property and rents it to the Historical Society for $1 annually. Baldwin said the funds are coming out of the building repair budget. He then went on when again pressed about the finances to say that costs also unexpectedly came in like a $5,000 annual license fee for plate readers for the Police Department. It should have been a budgeted item for the 2019 fiscal year, but was left out and the bill had to be paid out. It was items like this that concerned the council, especially Seiz. "Literally if money stopped coming in today, we'd be in trouble," Seiz said. "The citizens need to know that they're getting what they're paying for." Fee asked also why the city went from near bankruptcy to solvency during the days when Hal Kuhn was in charge of the finances, to now back to having problems again. Baldwin said he believed it was because the city tightened up, "had only a police officer and a half for, two years?" "The money they saved came off the backs of the employees," Baldwin said. Fee added that it was partly due to employees, but also partly due to the sale of equipment to keep the city from falling into a deep financial hole several years ago. "I would be tickled to just get back to half of that," Fee said. He went on to ask for Baldwin's plan to raise the city's coffers. Baldwin said he wanted to get through the rest of the fiscal year and "take a hard look at it next year, and take a hard look at what we can do to re-align this budget, and hope that Rick can find some money." "I don't know at this point," he said. Baldwin also said during questioning about the hire of Sgt. Christian Cruz that money spent previously from the Special Assets Account was because of "the council before you. In 2017, they spent half of it. But they spent it on good things the people needed." "You think that the special assets fund is gone, but it is being paid back every month from the SPLOST check. You forget that you loaned more than $100,000 from the Special Assets Account to SPLOST to buy police cars and trucks and sidearm holders... and that SPLOST money comes back in between now and June 2020. That money comes in every month to pay it back. That's what the Special Assets Account is supposed to be." When asked by Fee to have stricter stipulations on an account that was supposed to be opened in December 2018 per Fee's request and a council vote, but hasn't yet. Baldwin explained the city was waiting to see who the second signatory would be as Mayor Pro Tem, which remains Pittman for the year after a unanimous vote during the regular meeting. Fee said he wants to ensure that the money is only used for emergencies, which Baldwin said was a discussion he, Hartley and Fee would have to sit down and have. "Now you're also talking about protecting your employees," Baldwin continued. "You didn't take an oath to protect employees. You took an oath of office to protect the people of the City of Aragon. To look out as their safeguard. And part of it is taking care of those employees, but it's not solely that. What good does it do if you have the money to pay an employee, but you can't afford to buy the gas to go in the vehicles for them to work. They'd just have to set in the shop." Financials are believed to be in dire enough straits to give impetus for one longtime employee to say goodbye to the city. Public Works Superintendent and Code Enforcement Officer Daniel Johnson announced during the work session last Thursday that he had as of that night turned in his two-week notice. Johnson told council members he was making the move in order to ensure that his family would have financial stability and not have to worry about whether pay was going to come in. He made the announcement in part to ensure that come February, they are aware that they need to begin the process of adopting a new flood plain map for the city passed down from state officials. The map determines where state and federal officials believe an area is likely to flood, and what costs are associated for insurance protections. The council found they are still seeking a way forward on the city's financial health. "We're talking about Rick coming for four days next month, and I'd like for us to sit down with him," Fee said in the work session. "There's got to be some kind of explanation. People need to know they're going to have a reliable job... We've got to have some kind of safety net." In the aftermath of the city's work session ahead of their January regular meeting at city hall, the council took the unusual step of not voting at all on the city's financial statement for the month. Fee also used his time to continue to push for better financial controls. They also approved a $495 fee to continue providing AirMed as an option for flights to hospitals should the need ever arise as part of the employee benefits package. It only applies to full time employees. Baldwin called for an extra day of work session, but did not provide an immediate date and time. The council did approve an update to the city's portion of the Joint Comprehensive Plan as well, and undertook the final reading and approval of the false alarm ordinance. An inmate housing agreement draft was also presented to the council, but it was completely dropped since it wasn't ready for approval. In a follow-up interview, Sheriff Johnny Moats said it was something he would like to see completed in the near future, but it would be based on whether Local Option Sales Tax agreements can be negotiated between the cities and the county, which was when the inmate housing fees were agreed to. Community gathers in several events during weekend to celebrate Martin Luther King Jr.
Apostle Trixie Morgan lent her voice to the proceedings of the 2019 MLK Jr. Breakfast at the Cedar Lake Christian Center in Cedartown on Saturday morning, Jan. 19. The Marietta Street Adult Dance Ministry provided worship through dance during the 2019 MLK Jr. Breakfast held at the Cedar Lake Christian Center in Cedartown on Saturday morning, Jan. 19, 2019. Betty Cornwall, the Executive Director for Helping Hands, was one of the four nominees for community service awards in 2019. She gave her thanks for the nomination at the annual MLK breakfast on Jan. 19, 2019, and said she and her husband Clint provide their volunteer help not seeking fanfare. Marvin Williams was one of several who offered their voices in song and praise during the annual MLK Breakfast at Cedar Lake Christian Center on Saturday morning, Jan. 19. The annual celebrations of Rev. 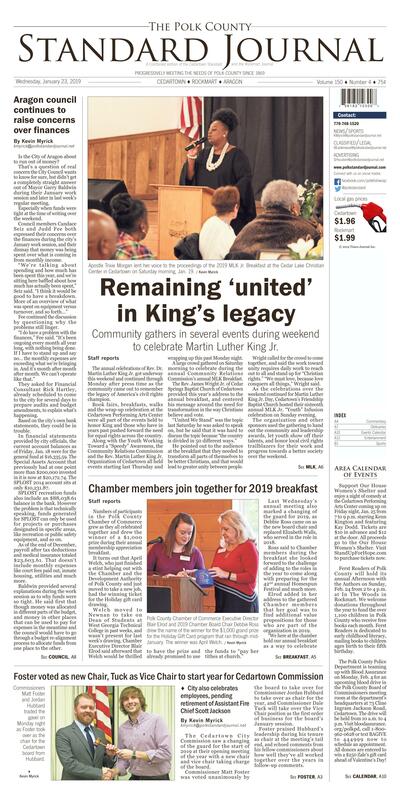 Dr. Martin Luther King Jr. got underway this weekend and continued through Monday after press time as the community came out to remember the legacy of America's civil rights champion. Book fairs, breakfasts, walks and the wrap-up celebration at the Cedartown Performing Arts Center were all part of the events held to honor King and those who have in years past pushed forward the need for equal rights across the country. Along with the Youth Working Toward a "Speedy" Awareness, the Community Relations Commission and the Rev. Martin Luther King Jr. Organization of Cedartown all held events starting last Thursday and wrapping up this past Monday night. A large crowd gathered on Saturday morning to celebrate during the annual Community Relations Commission's annual MLK Breakfast. The Rev. James Wright Jr. of Cedar Springs Baptist Church of Cedartown provided this year's address to the annual breakfast, and centered his message around the need for transformation in the way Christians believe and vote. "United We Stand" was the topic last Saturday he was asked to speak on, but he said that it was hard to discuss the topic because "the country is divided in 50 different ways." He pointed out to the audience at the breakfast that they needed to transform all parts of themselves to be better Christians, and that would lead to greater unity between people. Wright called for the crowd to come together, and said the work toward unity requires daily work to reach out to all and stand up for "Christian rights." "We must love, because love conquers all things," Wright said. As the celebrations over the weekend continued for Martin Luther King Jr. Day, Cedartown's Friendship Baptist Church hosted their sixteenth annual MLK Jr. "Youth" Infusion celebration on Sunday evening. The organization and other sponsors used the gathering to hand out the community and leadership awards, let youth show off their talents, and honor local civil rights trailblazers for their work and progress towards a better society over the weekend. Frank Kenneth Jones was named 2019's trailblazer and will be honored alongside former recipients of the award including 2014 trailblazer Sarah Darden, 2015 trailblazers Gladys Gipson and David Huskins, 2016 trailblazer John Callins, 2017 trailblazer Mary Callins, and 2018 trailblazer Estella McDermott. Those who took part also got to witness this year's MLK Jr. Proclamation from the Cedartown Board of Commissioners, and keynote speakers, dance performances, and much more promise to make the event worth attending. Monday events wrapped up after press time with the annual MLK Walk held in downtown Cedartown on Main Street, and the 30th annual celebration at the Cedartown Performing Arts Center during the evening. They also honored community members who were finalists for honors for giving back in Polk County. This year's nominees included but weren't limited to James Diamond for his role as a youth sports organizer and inspirational speaker, and Betty and Clint Cornwall of Helping Hands Food Pantry for their nearly two decades of providing food to Polk County residents in need. Community volunteer Hardy Sams also was nominated for 2019, along with Joan Young. Check back in the Jan. 30 edition for more on the nominees and winners and additional MLK celebration coverage. Polk County Chamber of Commerce Executive Director Blair Elrod and 2019 Chamber Board Chair Debbie Ross drew the name of the winner for the $1,000 grand prize for the Holiday Gift Card program that ran through mid-January. The winner was April Welch. 2019 Chamber Board Chair Debbie Ross spoke to members during the annual Appreciation Breakfast on Jan. 16. Numbers of participants in the Polk County Chamber of Commerce grew as they all celebrated together and drew the winner of a $1,000 prize during their annual membership appreciation breakfast. It turns out that April Welch, who just finished a stint helping out with the Chamber and the Development Authority of Polk County and just moved to take a new job, had the winning ticket for the Holiday gift card drawing. Welch moved to Newnan to take on Dean of Students at West Georgia Technical College in past weeks, and wasn't present for last week's drawing. Chamber Executive Director Blair Elrod said afterward that Welch would be thrilled to have the prize and already promised to use the funds to "pay her tithes at church." Last Wednesday's annual meeting also marked a changing of the guard for 2019, as Debbie Ross came on as the new board chair and replaced Elizabeth Walls, who served in the role in 2018. Ross said to Chamber members during the breakfast she looked forward to the challenge of adding to the roles in the year to come along with preparing for the 42 nd annual Homespun Festival and much more. Elrod added in her address to the gathered Chamber members that her goal was to find additional value propositions for those who are part of the organization in 2019.
our members," Elrod said. "Small business is the backbone of our county and we are proud that each of them has chosen Polk County for their business to call home." Elrod was able to announce during her remarks that Chamber membership grew in 2019 to more than 280 members, with only three businesses that dropped out and only due to their closure in the past year. The Chamber also heard from Business Development committee chair Zach Thomas, Workforce Development and Education committee chair Katie Thomas, and Janet Ross, the chair of the Government Affairs committee. Chamber members also welcomed new board members in 2019 and include Polk County Standard Journal Editor Kevin Myrick, Cedartown First United Methodist Church Pastor Reverend Mike Broome and Daniel Bevels, who heads up public relations for Polk Medical Center, Anna Vaagen of South Marble Coffee Shop and Victoria Raymond of H&R Block of Cedartown and Rockmart. Commissioners Matt Foster and Jordan Hubbard traded the gavel on Monday night as Foster took over as the chair for the Cedartown board from Hubbard. Commissioners Jordan Hubbard and Matt Foster traded places on Monday, January 14 as one gave up the chair's gavel, and the other took it over. Michael Hooper was named this year's Bobby Alexander Public Works Award winner for the City of Cedartown. Officer Tyler Eason won the Ray Merritt Public Safety Award. Aimee Madden, the City's Director of Tourism and Economic Development, won the Emily Shaw Administration Award for 2019. The Cedartown City Commission saw a changing of the guard for the start of 2019 at their opening meeting of the year with a new chair and vice chair taking charge of the board. Commissioner Matt Foster was voted unanimously by the board to take over for Commissioner Jordan Hubbard to take over as chair for the year, and Commissioner Dale Tuck will take over the Vice Chair position as the first order of business for the board's January session. Foster praised Hubbard's leadership during his tenure as chair at the meeting's tail end, and echoed comments from his fellow commissioners about how well they've all worked together over the years in follow-up comments. "I first want to thank our outgoing chairman Jordan Hubbard, who has ably led this board the past two years, as well my other fellow commissioners, for putting their vote of confidence in me," Foster said. "It continues to be my honor to represent the people of our city, and I am looking forward to another year of progress with a wonderful, people-centered commission and administration." Hubbard during his comments at meeting's end that "I do love my city and thankful that you have allowed me to serve." Celebrations were also held to honor the service of Assistant Fire Chief Scott Jackson after his 25 year career with the Cedartown Fire Department comes to a close at January's end. He was presented with a gift from the city to honor his service, and was the last honored for the night during employee longevity awards as well. Many other employees also were honored for their hard work over the past year. Michael Hooper was named this year's Bobby Alexander Public Works Award winner for the City of Cedartown. Officer Tyler Eason won the Ray Merritt Public Safety Award, and Aimee Madden was honored with the Emily Shaw Administration Award winner for 2019. Additionally, employees with five years of service that included ..., and employees with 10 years of service that were honored included .... . Commissioners got to also hear the good news of an employee earning a promotion. City Manager Bill Fann announced that Mitzi Allen was recently named the new Assistant City Clerk, taking over for Edward Guzman after his promotion to Assistant City Manager. Allen is expected to attend additional training for municipal clerks later this year. The celebration of employees extended into the commissioner's comments on Monday night, when each had their own particular good words of encouragement for all those who serve day to day to keep the city functioning. Payton's comments near the end of the night made it clear that when she and other commissioners are representing the city statewide, what they hear from everyone else is nothing but praise for what "great employees we have in Cedartown." "Great things are happening in Cedartown even though you aren't seeing and feeling it right in the moment, most people notice what's going on," she said. During January's meeting, Commissioners also approved keeping Andrew Roper as the city's municipal court judge, and State Rep. Trey Kelley as their solicitor in his day job as an attorney. They were also supposed to hear from a representative of the U.S. Census Bureau, but they were unable to attend according to Fann. Support Our House Women's Shelter and enjoy a night of comedy at the Cedartown Performing Arts Center coming up on Friday night, Jan. 25 from 7 to 9 p.m. starring Kenn Kington and featuring Kay Dodd. Tickets are $10 in advance and $12 at the door. All proceeds go to the Our House Women's Shelter. Visit StandUpForHope.com to purchase tickets now. Ferst Readers of Polk County will hold its annual Afternoon with the Authors on Sunday, Feb. 24 from 2 to 4 p.m. at In The Woods in Rockmart. We welcome donations throughout the year to fund the over 1,100 children in Polk County who receive free books each month. Ferst Readers is dedicated to early childhood literacy, mailing books to children ages birth to their fifth birthday. The Polk County Police Department is teaming up with Blood Assurance on Monday, Feb. 4 for an upcoming blood drive in the Polk County Board of Commissioners meeting room at the department's headquarters at 73 Cline Ingram Jackson Road, Cedartown. The drive will be held from 10 a.m. to 4 p.m. Visit bloodassurance.org/polkpd, call 1-800-962-0628 or text BAGIVE to 444999 now to schedule an appointment. All donors are entered to win a $250 Zale's gift card ahead of Valentine's Day! On Saturday, March 2, 2019 at 9 a.m., the Polk County Republican Party will convene Precinct Mass Meetings to elect Delegates and Alternates to the Polk County Republican Party Convention at the Cherokee Country Club, 150 Club Drive in Cedartown. Registration will begin at 8 a.m. The convention will start at 10 a.m., and costs are $10. Contact Dr. Marc Wall at 770-749-0420 about the upcoming convention and monthly meetings of the party. The Gold City Quartet is coming to the First Baptist Church of Cedartown for an evening concert on Sunday, February 17 at 6 p.m. a love offering is being taken up, but it is free to attend. Come join in a night of gospel at First Baptist Church of Cedartown, located at 101 N College St. Contact the church at 770-748-3120 for more information. The American Legion in Rockmart is hosting their monthly all-you-can-eat spaghetti dinner coming up on February 20, 2019. Meal of spaghetti, meatballs, garlic toast and salad, $5. Join the group for a good meal and to support veteran and children's programs. The Legion is located at 1 Veterans Circle, Rockmart.